The Toronto Raptors have come a long way. Once an NBA outpost, the franchise is now a perennial powerhouse and a legitimate championship contender. And it just so happens to have coincided with Drake’s tenure as the team’s global ambassador. Prior to his arrival in 2013, the Raptors had missed the playoffs in five straight seasons, winning an average of 30 games per year. Star players like Vince Carter (2004), Tracy McGrady (2000), and Chris Bosh (2010) left without thinking twice, making it consistently difficult for the organization to retain top-level talent. Maybe it was the fact that the Raptors were a Canadian team, or maybe it was just that ownership didn’t know how to harness the passion of the fanbase. Either way, the team was bad for years. They failed to draw league-leading crowds and, with the exception of some glimmers of hope during the Carter era, didn’t have much of a chance at a title. I’ll be frank. I’m not a huge fan of Drake’s music. It’s just not my style. But, I am a huge fan of Drake as a person, and most importantly, as an advocate for basketball in Toronto. The 32-year-old recording artist is also the team’s most famous fan, often seen sitting in his courtside seats at games. Easily the most enthusiastic fan in attendance, he can be seen pumping his fist after a triumphant three-pointer or high-fiving players as they walk off the court. It’s always fun to spot celebrities in the stands supporting their favourite teams, but it’s even more fun when they’re just as invested as the rest of the fans are. But Drake is way more than just a fan. The Raptors now host an annual “Drake Night” that features specially themed black and gold jerseys and uniquely stylized court paintings. “He’s lifted us in more ways than you can even know,” said Raptors president Masai Ujiri in an interview with ESPN last season. As Drake has rose to prominence, so have the Raptors. Upon joining the organization in September 2013, Drake had only released three studio albums, the newest of which, the multi-platinum Nothing Was the Same, hitting shelves a week before the announcement. 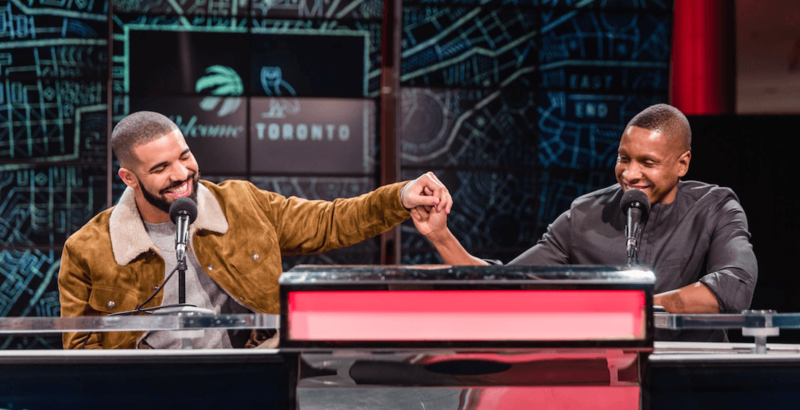 With Drake involved in one of the NBA’s most progressive marketing strategies, the Raptors quickly became one of the league’s most dominant and consistent clubs. Toronto has never missed the playoffs in the Drake era, winning their division four times. He has helped the bottom line as well, as the Raptors franchise has more than doubled in value since the partnership according to Forbes. Drake has developed real relationships with Raptors players. Suddenly, instead of stars wanting out of town, DeMar DeRozan and Kyle Lowry signed contract extensions. Whether jokingly (or not-so-jokingly) expressing his desire to eventually own the team, or cheering on the team courtside, Drake has valiantly shown the NBA’s biggest stars that if they’re interested in relocating to a pop culture hub with a growing competitive attitude and a rapidly expanding fanbase, they should look no further than the Six. While the team’s success is bound to fluctuate, one thing that won’t change is the passionate loyalty of one of music’s biggest, brightest, and most Canadian stars, making Toronto a more desirable NBA destination. A first-year student at Toronto's Ryerson University, Hayden is an aspiring blogger and writer with a vehement obsession with all things sports.